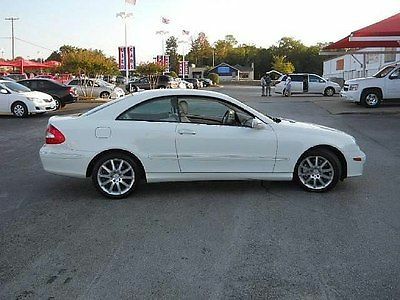 White Mercedes CLK 350 for sale. Never been in an accident and always cared for. Recently spent a lot of money in Maintenance so this car is ready to go. The car has Navigation, Push Start ignition, Premium Wheels and low mileage.The transmission was recently replace and the new transmission has 33,000 miles. Some of the other maintenance that was recently done are tires, brakes, and thermostat sensors. A lot of money invested.This car has a very fun to drive. The rear windows go down which is not common in a coupe so it really has a convertible feel during the summer time. 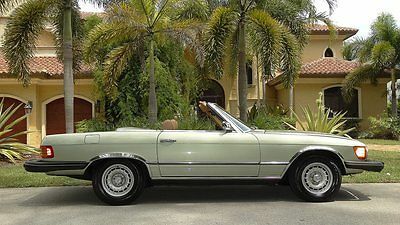 Sport Leicht Auto Gallery is pleased to offer a 1978 450SL for sale! Color: Grey-Blue (DB-906G)Interior: Parchment (cream-beige) MB-TEXSoft Top: Navy BlueMiles: 101,600 originalBeautiful rare color combo you'll fall in love with on this 450SL. It's difficult to find an original elegant color with an interior that matches so well and finished with a sharp contrasting Navy Blue soft top. The MB-TEX parchment interior shows no rips or tears and shows in very presentable condition. Paint is largely original with some respray done with good quality craftsmanship. Body panels appear to be straight. There are no paint or rust bubbles anywhere. There is no rust on this vehicle including the undercarriage that's clean and dry. Lots of preventative and regular maintenance work has been done on the vehicle in last 5 years including timing chain, tensioner, rails, plugs, cap, rotor, AC, servo replacement and the list goes on. Service records available. Recently had the AC serviced and fully recharged. AC Conversion has already been changed to 134 and it really blows strong and ICE COLD, something you do not find often on 450's of this age. Motor runs strong and shifts smooth through all gears. The previous 3 owners took care of the vehicle and it shows as it was garaged and covered. The original owner had it for the majority of time and passed it down to his daughter. In the later years it was sold to a close friend of the family. Dashboard is original and has a few small cracks showing. Car comes with a dashboard cover and kit to install. There is a newly installed Sony CD audio system with USB connection the previous owner purchased. The original Becker Radio that was removed also comes with car. The removable hard top is in nice condition including the interior lining and glass. Soft top is Navy Blue and was recently replaced according to previous owner and visual inspection but does have a tear above passenger head space. We will try and work a good price for soft top replacement from one of our vendors if it's important for you.The wheels are original MBZ factory 14 inch alloy non chrome in nice condition not showing scratches and curb rash. Dashboard lights and cluster are all in working order as are the windows and switches. We have all keys, books, manuals and a large file of service records on the car. We will work with your shipper and can recommend domestic and international shipping companies. The port closest for int'l shipping export is Long Beach, California.Contact phone: Jay @ 424-276-0570. I'll be happy to answer any of your questions.Pre-Purchase Inspections are welcomed and encouraged! We want to answer any questions you may have on the vehicle and are totally transparent. Please, serious buyers. Email questions to: SALES@SLAUTOGALLERY.COM or visit SLAUTOGALLERY.COM for more detailed info. A non-refundable $500.00 deposit is due within 48 hours after the winning bid is made. Deposit can be made in cash, via PAYPAL or bank wire transfer. All final payments are due within 7 days of auction close and can be made payable in person with cash, cashiers check or bank wire. No exceptions. Paypal will not be accepted for final payment. WE WILL NOT RELEASE THE VEHICLE until your funds have cleared our bank. All sales are final (as is where is). No returns accepted. No warranties expressed or implied on this vehicle. The car is for sale locally and we reserve the right to end this auction at any time. Please keep in mind you are bidding on a 39 year old vehicle with normal wear and tear and you must take into consideration these vehicles are not in perfect condition as you would find a new 2017 model.About us: We are a licensed DMV car dealer in the State Of California doing business as Sport Leicht Auto Gallery. We specialize primarily in Mercedes Benz "young classic" sales. We are located in Van Nuys, California. Please do not bid on this vehicle unless you are serious about purchasing. If you are a new eBay bidder please check in with us to verify your legitimate status. We do not lend in house or finance cars directly but if you need classic car financing options please call and we can recommend a few. DO NOT BID and waste time if you do not have your financing already approved and sorted. This is a waste of your time and ours. Bidders who do not respond for verification on their eBay status will be blocked. If you have any questions about our ebay account or any sales questions please call us at the phone number listed or email. ***THIS SALE IS BY CALIFORNIA DMV LICENSED DEALER - THERE WILL BE A $65.00 DEALER DOC PREPARATION FEE FOR ALL BUYERS.TO ALL CALIFORNIA RESIDENTS IF YOU ARE PLANNING TO REGISTER THE VEHICLE IN CALIFORNIA THERE ARE ADDITIONAL DMV LICENSE, REGISTRATION, CA SALES TAX AND SMOG FEES ON TOP OF THE PURCHASE PRICE. IF YOU NEED SPECIFICS I CAN HELP YOU CALCULATE. OUT OF STATE AND INT'L BUYERS**THESE CALIFORNIA TAX, DMV AND SMOG FEES DO NOT APPLY. 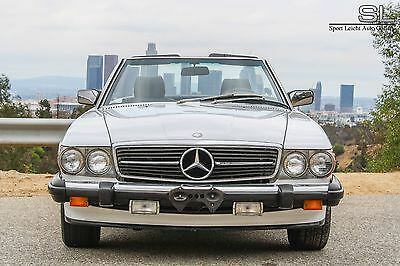 You are looking at a 1 owner 1987 Mercedes Benz 560SL offered for sale by Sport Leicht Auto Gallery! Vehicle Specs /// 62,300 Original documented milesColor Exterior: Arctic White (DB 147) Color Interior: Royal Blue LeatherSoft Top: blue German canvas original Poliglas Production Date: 07/87This is a (1) family owned vehicle that comes with the original MSRP window sticker from new purchase in 1987. Passed down from the owner's parents, this car has always been cared for with meticulous detail. Always garaged and covered as the condition of paint, chrome, glass and rubber all reflect this. *Please note the Autocheck on Ebay says 3 owners but this vehicle has documentation showing it's a (1) family owned vehicle. We have a clean Carfax available for review. Body panels are laser straight with even space between shut lines all factory specs. The vehicle is largely original paint with even depth and smoothness showing a hi-gloss finish. There are no signs or indications of accidents or body repair. Bolts are unturned and body panels still have the original vin tags affixed. There is no rust anywhere on the vehicle including the undercarriage. The interior is royal blue original leather. There are no rips or tears in the seats. All upholstery is in good shape without sagging or separations. The dashboard is original and has 2 very minor cracks. Carpet is also original in matching blue and shows very nice condition.Service records available. Original books, manuals, spare tool roll, spare tire/rim and 3 factory Huff keys. Hard top interior lining is excellent. Rare kinder back seat included with seat belts. Soft top is factory original and in great condition. Original Becker Grand Prix AM/FM Cassette player. Antennae power working including up and down push button. The engine bay is very tidy & clean. No leaks or drips to mention. The motor turns over immediately and idles smooth and even. Acceleration is very responsive and the motor has full power top to bottom. Transmission shifting is clean and crisp through all 4 gears with no delays or slipping. It drives just like Mercedes intended with a tight suspension and tracks straight down the highway. Nothing but a pleasure to drive!Everything works as it should. AC was recently serviced, blows ice cold and the control panel has just been replaced. We will work with your shipper and can recommend domestic and international shipping companies. The closest port is Long Beach, California. If you will be exporting the vehicle outside the U.S.A., please verify with your customs office or shipper for importation tax and vehicle registration costs.The VIN tag rivet located on the driver side door jam has a production date stamp of 07/87.Contact phone: Jay @ 424-276-0570. I'll be happy to answer any of your questions.Pre-Purchase Inspections are welcomed and encouraged! We want to answer any questions you may have on the vehicle and are totally transparent. Please, serious buyers. We sell many cars, this is our business please be respectful.Email questions to: SALES@SLAUTOGALLERY.COM or visit SLAUTOGALLERY.COM for more detailed info. A non-refundable $500.00 deposit is due within 48 hours after the winning bid is made. Deposit can be made in cash, via PAYPAL or bank wire transfer. All final payments are due within 7 days of auction close and can be made payable in person with cash, cashiers check or bank wire. No exceptions. Paypal will not be accepted for final payment. WE WILL NOT RELEASE THE VEHICLE until your funds have cleared our bank. All sales are final (as is where is). No returns accepted. No warranties expressed or implied on this vehicle. The car is for sale locally and we reserve the right to end this auction at any time. Please keep in mind you are bidding on a 30 year old vehicle with normal wear and tear and you must take into consideration these vehicles are not in perfect condition as you would find a new 2017 model. If you need to get financing please sort this out prior to bidding otherwise you are wasting your own time. We have no problem working with you on the purchase once your automotive financing is approved and in order. Our dealership does not finance or lend in house but there are a few classic car finance companies we can recommend...please get in touch prior to bidding. About us: We are a licensed DMV car dealer in the State Of California doing business as Sport Leicht Auto Gallery. 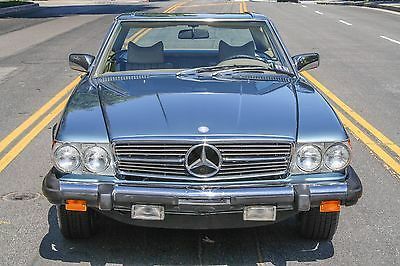 Our emphasis is on Mercedes Benz "young classic" sales. Our dealership is located in Van Nuys, California. Please do not bid on this vehicle unless you are serious about purchasing. There is NO POINT for either of us. If you are a new eBay bidder please check in with us to verify your legitimate status. Bidders who do not respond for verification on their eBay status will be blocked. If you have any questions at all about our ebay account, history, feedback or anything else related to vehicle sales please get in touch by the phone number or email provided and we'll get back to you. ***THIS SALE IS BY CALIFORNIA DMV LICENSED DEALER - THERE WILL BE A $65.00 DEALER DOC PREPARATION FEE FOR ALL BUYERS.TO ALL CALIFORNIA RESIDENTS IF YOU ARE PLANNING TO REGISTER THE VEHICLE IN CALIFORNIA THERE ARE ADDITIONAL DMV LICENSE, REGISTRATION, CA SALES TAX AND SMOG FEES ON TOP OF THE PURCHASE PRICE. IF YOU NEED SPECIFICS I CAN HELP YOU CALCULATE. OUT OF STATE AND INT'L BUYERS**THESE CALIFORNIA TAX, DMV AND SMOG FEES DO NOT APPLY. Dmitri (888) 847-9860 10391 Westminster Blvd Westminster Colorado 80020 ? ? ? ? Vehicle Information VIN: WDDJK6GA1HF047293 Stock: HF047293 Mileage: 5 Color: Selenite Gray Metallic Trans: Automatic Engine: 3.0 L MPG: 20 City / 28 Highway Drivetrain: RWD ? ? ? ? 1 of 30 ? View Large Images ? ? Options Contact Mercedes-Benz of Westminster 10391 Westminster Blvd Westminster Colorado 80020 View Map Ask for:Dmitri Contact: ?Contact Us Toll Free:(888) 847-9860 Dmitri Direct:(303) 464-6639 Dmitri Text / Cell:(720) 254-8951 Terms Delivery and Handling Charges: To the negotiated price of each vehicle sold there will be added the sum of $599.00 for the cost and additional profit to the seller / Dealer for items such as inspecting, cleaning and adjusting new and used vehicles and preparing documents related to the sale. Placing a Bid: Your bid constitutes a legally binding contract to purchase this vehicle. Please do not bid if you're not seriously interested or financially able to purchase this vehicle. 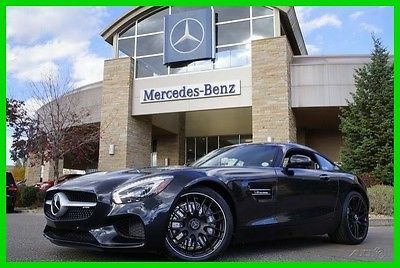 Please read eBay's User AgreementMercedes-Benz of Westminster reserves the right to, Obtain and verify the registered information of all users who bid on this auction. Cancel any and all bids at our discretion, or end the auction early if necessary.Bidders Age: You must be 18 years of age or older to Bid. Special eBay Bid Retraction Rules: Please read eBay's "Retracting a Bid" If you place a bid before the last 12-hour period of the auction: You may retract that bid before that last 12-hour period but only for exceptional circumstances. You will not be allowed to retract that bid during the last 12-hour period of the auction. If you place a bid during the last 12-hour period of the auction: You will be allowed to retract the bid for exceptional circumstances but only if you do so within one hour after placing the bid.Funds & Financing: For help in arranging for a Pre-Approved loan or for any questions please e-mail or phone Dmitri at (888) 847-9860 prior to bidding.Mercedes-Benz of Westminster does not provide financing or leasing options for CA residents due to emissions standards and regulations by the state of California. Cash purchase only for CA residents. Buyers Inspection: Mercedes-Benz of Westminster has done our best to disclose all information known about this vehicle for auction. Mercedes-Benz of Westminster welcomes a buyers inspection. If you plan to have a buyers inspection, please make sure you inspect the vehicle prior to the auction ending. Inspection fees if any are Buyers responsibility. Representations and Warranties made by seller: This vehicle is being sold "as is". Manufacturer's warranties may still apply. Extended warranty may be available, e-mail or phone Dmitri at (888) 847-9860 for details. No representations or warranties are made by seller, nor are any representations or warranties relied upon by bidders in making bids. Taxes and Registration fees: Out of state buyers are responsible for all state, county, city taxes and fees, as well as title service fees in the state that the vehicle will be registered. All taxes and fees must be paid in full in order for vehicle to be titled and registered. Title Information: Vehicles titles may be held by banks or lenders as collateral for loans. In many cases there is a delay in receiving the original instruments up to 21 days from the time we pay a vehicle off. While we usually have all titles in our possession at closing, there are occasions where we may be waiting for them to arrive. If payment is made by cashier's or personal checks we will hold all titles for 10 days or until funds have cleared. Shipping & Delivery: All shipping charges are buyer's responsibility. Mercedes-Benz of Westminster will help with shipping arrangements but will not be responsible in any way for claims arising from shipping damage!Licensed Carriers are generally insured for $3,000,000.00. We assume no responsibility for damages incurred after the vehicle leaves our showroom. 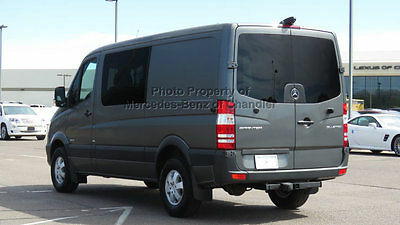 All shipping arrangements are provided by Mercedes-Benz of Westminster as a courtesy. We are not affiliated with any carrier. Any claims or other communication regarding shipment of vehicles will be between you and the shipper, not with Mercedes-Benz of Westminster. The amount of time it takes for delivery is dependent on the carrier, but is generally 7-14 days from the date the vehicle is picked up from our facility until it is delivered to your destination. Verify with the shipper for an Estimate Time of Arrival to be sure. Finalizing your Purchase: Mercedes-Benz of Westminster will contact the successful high bidder by e-mail after the auction closes. 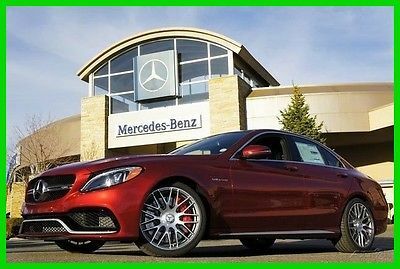 Successful high bidder MUST communicate with Dmitri at Mercedes-Benz of Westminster by e-mail or phone (888) 847-9860 within 24 hours of the auction ending to make arrangements to complete their transaction. If we cannot confirm your intention to buy or the sale is not completed within 5 days, we reserve the right to relist this vehicle or sell to any other qualified buyer. In order to secure bid on vehicle, Successful bidder (BUYER) must within 24 hours of bid closing send to Seller a Deposit in the amount of 10% by major credit card, cash in person or bank certified funds. Within 72 hours of bid closing, Buyer must send balance of funds by cash in person or bank certified funds to Seller. At time of sending initial deposit, Buyer MUST fax or email copy of their State issued valid Driver License. Furthermore, before said vehicle is released for shipment to Buyer, all other Sale related and title related paperwork must be signed and returned complete to Seller. Copyright © 2017 Auction123 - All rights reserved. - Disclaimer +- Auction123 (a service and listing/software company) and the Seller has done his/her best to disclose the equipment/condition of this vehicle/purchase. However, Auction123 disclaims any warranty as to the accuracy or to the working condition of the vehicle/equipment listed. The purchaser or prospective purchaser should verify with the Seller the accuracy of all the information listed within this ad. Selling a Vehicle? Create Professional Listings Fast and Easy. Click Here! Dmitri & Jared (888) 847-9860 10391 Westminster Blvd Westminster Colorado 80020 ? ? ? ? Vehicle Information VIN: WDDYJ7HA5HA011674 Stock: HA011674 Mileage: 5 Color: Magnetite Black Metallic Trans: Automatic Engine: 4.0 L MPG: 16 City / 22 Highway Drivetrain: RWD ? ? ? ? 1 of 44 ? View Large Images ? ? Options Contact Mercedes-Benz of Westminster 10391 Westminster Blvd Westminster Colorado 80020 View Map Ask for:Dmitri & Jared Contact: ?Contact Us Toll Free:(888) 847-9860 Dmitri Direct:(303) 464-6639 Jared Direct :(303) 410-7805 Dmitri Text / Cell:(720) 254-8951 Jared Text / Cell:(720) 641-7739 Terms Delivery and Handling Charges: To the negotiated price of each vehicle sold there will be added the sum of $599.00 for the cost and additional profit to the seller / Dealer for items such as inspecting, cleaning and adjusting new and used vehicles and preparing documents related to the sale. Placing a Bid: Your bid constitutes a legally binding contract to purchase this vehicle. Please do not bid if you're not seriously interested or financially able to purchase this vehicle. Please read eBay's User AgreementMercedes-Benz of Westminster reserves the right to, Obtain and verify the registered information of all users who bid on this auction. Cancel any and all bids at our discretion, or end the auction early if necessary.Bidders Age: You must be 18 years of age or older to Bid. Special eBay Bid Retraction Rules: Please read eBay's "Retracting a Bid" If you place a bid before the last 12-hour period of the auction: You may retract that bid before that last 12-hour period but only for exceptional circumstances. You will not be allowed to retract that bid during the last 12-hour period of the auction. If you place a bid during the last 12-hour period of the auction: You will be allowed to retract the bid for exceptional circumstances but only if you do so within one hour after placing the bid.Funds & Financing: For help in arranging for a Pre-Approved loan or for any questions please e-mail or phone Dmitri at (888) 847-9860 prior to bidding.Mercedes-Benz of Westminster does not provide financing or leasing options for CA residents due to emissions standards and regulations by the state of California. Cash purchase only for CA residents. Buyers Inspection: Mercedes-Benz of Westminster has done our best to disclose all information known about this vehicle for auction. Mercedes-Benz of Westminster welcomes a buyers inspection. If you plan to have a buyers inspection, please make sure you inspect the vehicle prior to the auction ending. Inspection fees if any are Buyers responsibility. Representations and Warranties made by seller: This vehicle is being sold "as is". Manufacturer's warranties may still apply. Extended warranty may be available, e-mail or phone Dmitri at (888) 847-9860 for details. No representations or warranties are made by seller, nor are any representations or warranties relied upon by bidders in making bids. Taxes and Registration fees: Out of state buyers are responsible for all state, county, city taxes and fees, as well as title service fees in the state that the vehicle will be registered. All taxes and fees must be paid in full in order for vehicle to be titled and registered. Title Information: Vehicles titles may be held by banks or lenders as collateral for loans. In many cases there is a delay in receiving the original instruments up to 21 days from the time we pay a vehicle off. While we usually have all titles in our possession at closing, there are occasions where we may be waiting for them to arrive. If payment is made by cashier's or personal checks we will hold all titles for 10 days or until funds have cleared. Shipping & Delivery: All shipping charges are buyer's responsibility. Mercedes-Benz of Westminster will help with shipping arrangements but will not be responsible in any way for claims arising from shipping damage!Licensed Carriers are generally insured for $3,000,000.00. We assume no responsibility for damages incurred after the vehicle leaves our showroom. All shipping arrangements are provided by Mercedes-Benz of Westminster as a courtesy. We are not affiliated with any carrier. Any claims or other communication regarding shipment of vehicles will be between you and the shipper, not with Mercedes-Benz of Westminster. The amount of time it takes for delivery is dependent on the carrier, but is generally 7-14 days from the date the vehicle is picked up from our facility until it is delivered to your destination. Verify with the shipper for an Estimate Time of Arrival to be sure. Finalizing your Purchase: Mercedes-Benz of Westminster will contact the successful high bidder by e-mail after the auction closes. 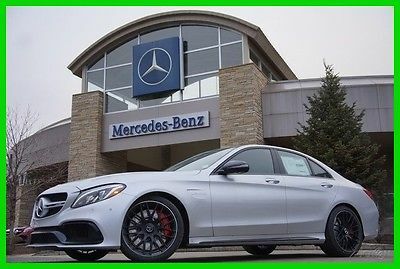 Successful high bidder MUST communicate with Dmitri at Mercedes-Benz of Westminster by e-mail or phone (888) 847-9860 within 24 hours of the auction ending to make arrangements to complete their transaction. If we cannot confirm your intention to buy or the sale is not completed within 5 days, we reserve the right to relist this vehicle or sell to any other qualified buyer. In order to secure bid on vehicle, Successful bidder (BUYER) must within 24 hours of bid closing send to Seller a Deposit in the amount of 10% by major credit card, cash in person or bank certified funds. Within 72 hours of bid closing, Buyer must send balance of funds by bank wire transfer, cash in person, bank certified funds to Seller. At time of sending initial deposit, Buyer MUST fax or email copy of their State issued valid Driver License. Furthermore, before said vehicle is released for shipment to Buyer, all other Sale related and title related paperwork must be signed and returned complete to Seller. Copyright © 2017 Auction123 - All rights reserved. - Disclaimer +- Auction123 (a service and listing/software company) and the Seller has done his/her best to disclose the equipment/condition of this vehicle/purchase. However, Auction123 disclaims any warranty as to the accuracy or to the working condition of the vehicle/equipment listed. The purchaser or prospective purchaser should verify with the Seller the accuracy of all the information listed within this ad. Selling a Vehicle? Create Professional Listings Fast and Easy. Click Here! 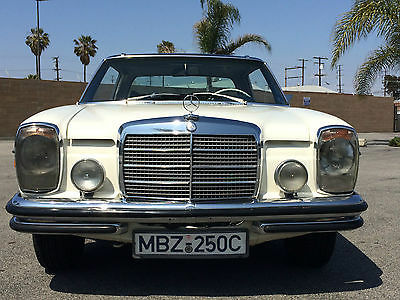 Honestly it doesn't really get much better than this...the 1971 Mercedes Benz 250C Coupe combines timeless classic good looks with an absolutely stunning ride. The 250/280C's are some of my absolute favorite automobiles. They are quickly becoming one of the hottest cars on the market in terms of collectability. You just don't find a car that comes close to the value you get for the little amount of money you have to invest. This particular example is a true gem. You don't see that many of them from the factory ordered with two tone paint, a floor shift and a sunroof. The windows are manual and the sunroof is power. This is the European combo you want. You do NOT want power windows as they are pain to upkeep and expensive to maintain. Yes I put Euro headlights on it and left the American foglamps. Why did I do this? Because it looks great and people compliment on it constantly. No the white steering did not originally come with the car and no you do not get it when I sell the car. You will get the perfect condition black steering wheel that came with the car. The white one was given to me by my mechanic and I'm keeping so don't bother asking folks. :) A lot of money has been put in to this car and I have all the receipts. Its just a solid daily driver. Yes the A/C works! :) One thing about the car is that someone put one of those aftermarket dash pads on it and I would want an original dash back on it eventually but this is something you may or may not care about it. Fly in and drive it home. You can drive it across the US and be a country gentleman all the way. Thanks for stopping by! 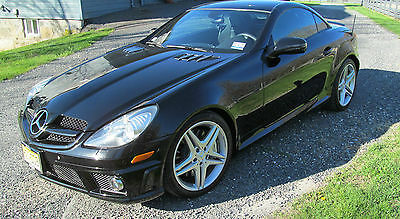 Mercedes 2009 SLK AMG 55 Roadster Convertible Black on Black Garage kept - weekend driving. This car is a rocket ship! High performance, excellent handling.0 to 60 in 4.9 seconds!!!! This month (may 2015) I had a new battery installed and a all point check from Mercedes to insure convertible top and all are in top operation. Standard road wear - otherwise excellent condition. If you want a high performance Mercedes - this is it!!! Driven only on weekends. I am selling because I really don't have time to enjoy the car - its a shame to let this beast sit idle. Car is located in Bayridge Brooklyn, NY for pickup. 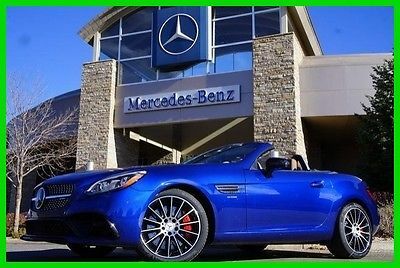 Some specifics 5.4 L - 355 hp V8 Engine 0-62mph: 4.9 Seconds Top Speed: 155mph A modified version of this model was used in Formula One as its Safety Car during the 2004 and 2005 Seasons The SLK55 AMG was also the first Mercedes tuned by AMG's Performance Studio to create the new "Black Series". Vario-roof The roof design developed by Mercedes-Benz consists of a folding steel hard top which is divided in half along an axis at right angles to the direction of travel. Both halves are linked by a kinematic mechanism which is locked securely when the roof is closed. At the touch of a button on the centre console, a hydraulic system with five cylinders controls the fully automatic folding process in which the boot lid is also integrated. It opens by tipping to the rear so that the two roof halves have sufficient freedom of movement to pivot backwards as the vario-roof opens; the roof sections then position themselves one on top of the other, and disappear into the boot. If the roof is to be closed, the same sequence of movements is performed in reverse order. The hydraulic system stows the vario-roof in the upper section of the boot. A plastic roller blind separates it from the luggage space below, an area with a capacity of 145 litres in the first-generation SLK. With the vario-roof closed, the load volume increased to a substantial 348 litres (12.3 cu ft). Two fixed roll-over bars behind the seats worked with the particularly strong A-pillars to form an integrated system offering a high degree of roll-over protection. The steel roof provides added protection, which is normally found in a coupe, but with the enjoyment of a convertible at the same time. The technology was considered advanced as its rivals still had folding cloth tops. Dmitri (888) 847-9860 10391 Westminster Blvd Westminster Colorado 80020 ? ? ? ? Vehicle Information VIN: WDCYC7FF0HX268915 Stock: HX268915 Mileage: 26 Color: Gray Trans: Automatic Engine: 6.0 L MPG: Drivetrain: AWD ? ? ? ? 1 of 46 ? View Large Images ? ? Options Contact Mercedes-Benz of Westminster 10391 Westminster Blvd Westminster Colorado 80020 View Map Ask for:Dmitri Contact: ?Contact Us Toll Free:(888) 847-9860 Dmitri Direct:(303) 464-6639 Dmitri Text / Cell:(720) 254-8951 Terms Delivery and Handling Charges: To the negotiated price of each vehicle sold there will be added the sum of $599.00 for the cost and additional profit to the seller / Dealer for items such as inspecting, cleaning and adjusting new and used vehicles and preparing documents related to the sale. Placing a Bid: Your bid constitutes a legally binding contract to purchase this vehicle. Please do not bid if you're not seriously interested or financially able to purchase this vehicle. 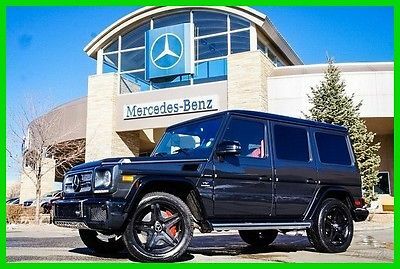 Please read eBay's User AgreementMercedes-Benz of Westminster reserves the right to, Obtain and verify the registered information of all users who bid on this auction. Cancel any and all bids at our discretion, or end the auction early if necessary.Bidders Age: You must be 18 years of age or older to Bid. Special eBay Bid Retraction Rules: Please read eBay's "Retracting a Bid" If you place a bid before the last 12-hour period of the auction: You may retract that bid before that last 12-hour period but only for exceptional circumstances. You will not be allowed to retract that bid during the last 12-hour period of the auction. If you place a bid during the last 12-hour period of the auction: You will be allowed to retract the bid for exceptional circumstances but only if you do so within one hour after placing the bid.Funds & Financing: For help in arranging for a Pre-Approved loan or for any questions please e-mail or phone Dmitri at (888) 847-9860 prior to bidding.Mercedes-Benz of Westminster does not provide financing or leasing options for CA residents due to emissions standards and regulations by the state of California. Cash purchase only for CA residents. Buyers Inspection: Mercedes-Benz of Westminster has done our best to disclose all information known about this vehicle for auction. Mercedes-Benz of Westminster welcomes a buyers inspection. If you plan to have a buyers inspection, please make sure you inspect the vehicle prior to the auction ending. Inspection fees if any are Buyers responsibility. Representations and Warranties made by seller: This vehicle is being sold "as is". Manufacturer's warranties may still apply. Extended warranty may be available, e-mail or phone Dmitri at (888) 847-9860 for details. No representations or warranties are made by seller, nor are any representations or warranties relied upon by bidders in making bids. Taxes and Registration fees: Out of state buyers are responsible for all state, county, city taxes and fees, as well as title service fees in the state that the vehicle will be registered. All taxes and fees must be paid in full in order for vehicle to be titled and registered. Title Information: Vehicles titles may be held by banks or lenders as collateral for loans. In many cases there is a delay in receiving the original instruments up to 21 days from the time we pay a vehicle off. While we usually have all titles in our possession at closing, there are occasions where we may be waiting for them to arrive. If payment is made by cashier's or personal checks we will hold all titles for 10 days or until funds have cleared. Shipping & Delivery: All shipping charges are buyer's responsibility. Mercedes-Benz of Westminster will help with shipping arrangements but will not be responsible in any way for claims arising from shipping damage!Licensed Carriers are generally insured for $3,000,000.00. We assume no responsibility for damages incurred after the vehicle leaves our showroom. All shipping arrangements are provided by Mercedes-Benz of Westminster as a courtesy. We are not affiliated with any carrier. Any claims or other communication regarding shipment of vehicles will be between you and the shipper, not with Mercedes-Benz of Westminster. The amount of time it takes for delivery is dependent on the carrier, but is generally 7-14 days from the date the vehicle is picked up from our facility until it is delivered to your destination. Verify with the shipper for an Estimate Time of Arrival to be sure. Finalizing your Purchase: Mercedes-Benz of Westminster will contact the successful high bidder by e-mail after the auction closes. Successful high bidder MUST communicate with Dmitri at Mercedes-Benz of Westminster by e-mail or phone (888) 847-9860 within 24 hours of the auction ending to make arrangements to complete their transaction. If we cannot confirm your intention to buy or the sale is not completed within 5 days, we reserve the right to relist this vehicle or sell to any other qualified buyer. In order to secure bid on vehicle, Successful bidder (BUYER) must within 24 hours of bid closing send to Seller a Deposit in the amount of 10% by major credit card, cash in person or bank certified funds. Within 72 hours of bid closing, Buyer must send balance of funds by cash in person or bank certified funds to Seller. At time of sending initial deposit, Buyer MUST fax or email copy of their State issued valid Driver License. Furthermore, before said vehicle is released for shipment to Buyer, all other Sale related and title related paperwork must be signed and returned complete to Seller. Copyright © 2017 Auction123 - All rights reserved. - Disclaimer +- Auction123 (a service and listing/software company) and the Seller has done his/her best to disclose the equipment/condition of this vehicle/purchase. However, Auction123 disclaims any warranty as to the accuracy or to the working condition of the vehicle/equipment listed. The purchaser or prospective purchaser should verify with the Seller the accuracy of all the information listed within this ad. Selling a Vehicle? Create Professional Listings Fast and Easy. Click Here! 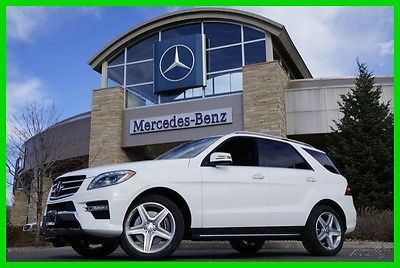 2014 Mercedes-Benz M-Class 2014 Mercedes-Benz ML550 Certified Factory Warranty 10/2018 - UNLIMITED MILES !!! Dmitri (888) 847-9860 10391 Westminster Blvd Westminster Colorado 80020 ? ? ? ? Vehicle Information VIN: 4JGDA7DB0EA281247 Stock: 281247 Mileage: 39,712 Color: Polar White Trans: Automatic Engine: 4.7 L MPG: 14 City / 19 Highway Drivetrain: AWD Description Lane Keeping Assist Package, Lane Tracking Package (Blind Spot Assist and Lane Keeping Assist), ML550 4MATICÂ®, Mercedes-Benz Certified, 4MATICÂ®, and Navigation System. This is a Certified Pre-Owned Mercedes-Benz with an UNLIMITED mileage limited warranty. Confused about which vehicle to buy? Well look no further than this charming 2014 Mercedes-Benz M-Class. This SUV will take you where you need to go every time...all you have to do is steer! Mercedes-Benz Certified Pre-Owned means you get an additional 12 months Limited Warranty on top of the existing factory warranty, with unlimited mileage. We also do up to a 162-point rigorous inspection/reconditioning, 24/7 roadside assistance, trip-interruption services, and a complete CARFAX vehicle history report. ? ? ? ? 1 of 43 ? View Large Images ? ? Options Contact Mercedes-Benz of Westminster 10391 Westminster Blvd Westminster Colorado 80020 View Map Ask for:Dmitri Contact: ?Contact Us Toll Free:(888) 847-9860 Dmitri Direct:(303) 464-6639 Dmitri Text / Cell:(720) 254-8951 Terms Delivery and Handling Charges: To the negotiated price of each vehicle sold there will be added the sum of $599.00 for the cost and additional profit to the seller / Dealer for items such as inspecting, cleaning and adjusting new and used vehicles and preparing documents related to the sale. Placing a Bid: Your bid constitutes a legally binding contract to purchase this vehicle. Please do not bid if you're not seriously interested or financially able to purchase this vehicle. Please read eBay's User AgreementMercedes-Benz of Westminster reserves the right to, Obtain and verify the registered information of all users who bid on this auction. Cancel any and all bids at our discretion, or end the auction early if necessary.Bidders Age: You must be 18 years of age or older to Bid. Special eBay Bid Retraction Rules: Please read eBay's "Retracting a Bid" If you place a bid before the last 12-hour period of the auction: You may retract that bid before that last 12-hour period but only for exceptional circumstances. You will not be allowed to retract that bid during the last 12-hour period of the auction. If you place a bid during the last 12-hour period of the auction: You will be allowed to retract the bid for exceptional circumstances but only if you do so within one hour after placing the bid.Funds & Financing: For help in arranging for a Pre-Approved loan or for any questions please e-mail or phone Dmitri at (888) 847-9860 prior to bidding.Mercedes-Benz of Westminster does not provide financing or leasing options for CA residents due to emissions standards and regulations by the state of California. Cash purchase only for CA residents. Buyers Inspection: Mercedes-Benz of Westminster has done our best to disclose all information known about this vehicle for auction. Mercedes-Benz of Westminster welcomes a buyers inspection. If you plan to have a buyers inspection, please make sure you inspect the vehicle prior to the auction ending. Inspection fees if any are Buyers responsibility. Representations and Warranties made by seller: This vehicle is being sold "as is". Manufacturer's warranties may still apply. Extended warranty may be available, e-mail or phone Dmitri at (888) 847-9860 for details. No representations or warranties are made by seller, nor are any representations or warranties relied upon by bidders in making bids. Taxes and Registration fees: Out of state buyers are responsible for all state, county, city taxes and fees, as well as title service fees in the state that the vehicle will be registered. All taxes and fees must be paid in full in order for vehicle to be titled and registered. Title Information: Vehicles titles may be held by banks or lenders as collateral for loans. In many cases there is a delay in receiving the original instruments up to 21 days from the time we pay a vehicle off. While we usually have all titles in our possession at closing, there are occasions where we may be waiting for them to arrive. If payment is made by cashier's or personal checks we will hold all titles for 10 days or until funds have cleared. Shipping & Delivery: All shipping charges are buyer's responsibility. Mercedes-Benz of Westminster will help with shipping arrangements but will not be responsible in any way for claims arising from shipping damage!Licensed Carriers are generally insured for $3,000,000.00. We assume no responsibility for damages incurred after the vehicle leaves our showroom. All shipping arrangements are provided by Mercedes-Benz of Westminster as a courtesy. We are not affiliated with any carrier. Any claims or other communication regarding shipment of vehicles will be between you and the shipper, not with Mercedes-Benz of Westminster. The amount of time it takes for delivery is dependent on the carrier, but is generally 7-14 days from the date the vehicle is picked up from our facility until it is delivered to your destination. Verify with the shipper for an Estimate Time of Arrival to be sure. Finalizing your Purchase: Mercedes-Benz of Westminster will contact the successful high bidder by e-mail after the auction closes. Successful high bidder MUST communicate with Dmitri at Mercedes-Benz of Westminster by e-mail or phone (888) 847-9860 within 24 hours of the auction ending to make arrangements to complete their transaction. If we cannot confirm your intention to buy or the sale is not completed within 5 days, we reserve the right to relist this vehicle or sell to any other qualified buyer. In order to secure bid on vehicle, Successful bidder (BUYER) must within 24 hours of bid closing send to Seller a Deposit in the amount of 10% by major credit card, cash in person or bank certified funds. Within 72 hours of bid closing, Buyer must send balance of funds by cash in person or bank certified funds to Seller. At time of sending initial deposit, Buyer MUST fax or email copy of their State issued valid Driver License. Furthermore, before said vehicle is released for shipment to Buyer, all other Sale related and title related paperwork must be signed and returned complete to Seller. Copyright © 2017 Auction123 - All rights reserved. - Disclaimer +- Auction123 (a service and listing/software company) and the Seller has done his/her best to disclose the equipment/condition of this vehicle/purchase. However, Auction123 disclaims any warranty as to the accuracy or to the working condition of the vehicle/equipment listed. The purchaser or prospective purchaser should verify with the Seller the accuracy of all the information listed within this ad. Selling a Vehicle? Create Professional Listings Fast and Easy. Click Here! Dmitri (888) 847-9860 10391 Westminster Blvd Westminster Colorado 80020 ? ? ? ? Vehicle Information VIN: 55SWF8HB9HU192687 Stock: HU192687 Mileage: 6 Color: designo Cardinal Red Metallic Trans: Automatic Engine: 4.0 L MPG: 18 City / 24 Highway Drivetrain: RWD ? ? ? ? 1 of 50 ? View Large Images ? ? Options Contact Mercedes-Benz of Westminster 10391 Westminster Blvd Westminster Colorado 80020 View Map Ask for:Dmitri Contact: ?Contact Us Toll Free:(888) 847-9860 Dmitri Direct:(303) 464-6639 Dmitri Text / Cell:(720) 254-8951 Terms Delivery and Handling Charges: To the negotiated price of each vehicle sold there will be added the sum of $599.00 for the cost and additional profit to the seller / Dealer for items such as inspecting, cleaning and adjusting new and used vehicles and preparing documents related to the sale. Placing a Bid: Your bid constitutes a legally binding contract to purchase this vehicle. Please do not bid if you're not seriously interested or financially able to purchase this vehicle. Please read eBay's User AgreementMercedes-Benz of Westminster reserves the right to, Obtain and verify the registered information of all users who bid on this auction. Cancel any and all bids at our discretion, or end the auction early if necessary.Bidders Age: You must be 18 years of age or older to Bid. Special eBay Bid Retraction Rules: Please read eBay's "Retracting a Bid" If you place a bid before the last 12-hour period of the auction: You may retract that bid before that last 12-hour period but only for exceptional circumstances. You will not be allowed to retract that bid during the last 12-hour period of the auction. If you place a bid during the last 12-hour period of the auction: You will be allowed to retract the bid for exceptional circumstances but only if you do so within one hour after placing the bid.Funds & Financing: For help in arranging for a Pre-Approved loan or for any questions please e-mail or phone Dmitri at (888) 847-9860 prior to bidding.Mercedes-Benz of Westminster does not provide financing or leasing options for CA residents due to emissions standards and regulations by the state of California. Cash purchase only for CA residents. Buyers Inspection: Mercedes-Benz of Westminster has done our best to disclose all information known about this vehicle for auction. Mercedes-Benz of Westminster welcomes a buyers inspection. If you plan to have a buyers inspection, please make sure you inspect the vehicle prior to the auction ending. Inspection fees if any are Buyers responsibility. Representations and Warranties made by seller: This vehicle is being sold "as is". Manufacturer's warranties may still apply. Extended warranty may be available, e-mail or phone Dmitri at (888) 847-9860 for details. No representations or warranties are made by seller, nor are any representations or warranties relied upon by bidders in making bids. Taxes and Registration fees: Out of state buyers are responsible for all state, county, city taxes and fees, as well as title service fees in the state that the vehicle will be registered. All taxes and fees must be paid in full in order for vehicle to be titled and registered. Title Information: Vehicles titles may be held by banks or lenders as collateral for loans. In many cases there is a delay in receiving the original instruments up to 21 days from the time we pay a vehicle off. While we usually have all titles in our possession at closing, there are occasions where we may be waiting for them to arrive. If payment is made by cashier's or personal checks we will hold all titles for 10 days or until funds have cleared. Shipping & Delivery: All shipping charges are buyer's responsibility. Mercedes-Benz of Westminster will help with shipping arrangements but will not be responsible in any way for claims arising from shipping damage!Licensed Carriers are generally insured for $3,000,000.00. We assume no responsibility for damages incurred after the vehicle leaves our showroom. All shipping arrangements are provided by Mercedes-Benz of Westminster as a courtesy. We are not affiliated with any carrier. Any claims or other communication regarding shipment of vehicles will be between you and the shipper, not with Mercedes-Benz of Westminster. The amount of time it takes for delivery is dependent on the carrier, but is generally 7-14 days from the date the vehicle is picked up from our facility until it is delivered to your destination. Verify with the shipper for an Estimate Time of Arrival to be sure. Finalizing your Purchase: Mercedes-Benz of Westminster will contact the successful high bidder by e-mail after the auction closes. Successful high bidder MUST communicate with Dmitri at Mercedes-Benz of Westminster by e-mail or phone (888) 847-9860 within 24 hours of the auction ending to make arrangements to complete their transaction. If we cannot confirm your intention to buy or the sale is not completed within 5 days, we reserve the right to relist this vehicle or sell to any other qualified buyer. In order to secure bid on vehicle, Successful bidder (BUYER) must within 24 hours of bid closing send to Seller a Deposit in the amount of 10% by major credit card, cash in person or bank certified funds. Within 72 hours of bid closing, Buyer must send balance of funds by cash in person or bank certified funds to Seller. At time of sending initial deposit, Buyer MUST fax or email copy of their State issued valid Driver License. Furthermore, before said vehicle is released for shipment to Buyer, all other Sale related and title related paperwork must be signed and returned complete to Seller. Copyright © 2017 Auction123 - All rights reserved. - Disclaimer +- Auction123 (a service and listing/software company) and the Seller has done his/her best to disclose the equipment/condition of this vehicle/purchase. However, Auction123 disclaims any warranty as to the accuracy or to the working condition of the vehicle/equipment listed. The purchaser or prospective purchaser should verify with the Seller the accuracy of all the information listed within this ad. Selling a Vehicle? Create Professional Listings Fast and Easy. Click Here! Dmitri (888) 847-9860 10391 Westminster Blvd Westminster Colorado 80020 ? ? ? ? Vehicle Information VIN: WDDPK6GA4HF132655 Stock: HF132655 Mileage: 6 Color: Brilliant Blue Metallic Trans: Automatic Engine: 3.0 L MPG: 20 City / 29 Highway Drivetrain: RWD ? ? ? ? 1 of 45 ? View Large Images ? ? Options Contact Mercedes-Benz of Westminster 10391 Westminster Blvd Westminster Colorado 80020 View Map Ask for:Dmitri Contact: ?Contact Us Toll Free:(888) 847-9860 Dmitri Direct:(303) 464-6639 Dmitri Text / Cell:(720) 254-8951 Terms Delivery and Handling Charges: To the negotiated price of each vehicle sold there will be added the sum of $599.00 for the cost and additional profit to the seller / Dealer for items such as inspecting, cleaning and adjusting new and used vehicles and preparing documents related to the sale. Placing a Bid: Your bid constitutes a legally binding contract to purchase this vehicle. Please do not bid if you're not seriously interested or financially able to purchase this vehicle. Please read eBay's User AgreementMercedes-Benz of Westminster reserves the right to, Obtain and verify the registered information of all users who bid on this auction. Cancel any and all bids at our discretion, or end the auction early if necessary.Bidders Age: You must be 18 years of age or older to Bid. Special eBay Bid Retraction Rules: Please read eBay's "Retracting a Bid" If you place a bid before the last 12-hour period of the auction: You may retract that bid before that last 12-hour period but only for exceptional circumstances. You will not be allowed to retract that bid during the last 12-hour period of the auction. If you place a bid during the last 12-hour period of the auction: You will be allowed to retract the bid for exceptional circumstances but only if you do so within one hour after placing the bid.Funds & Financing: For help in arranging for a Pre-Approved loan or for any questions please e-mail or phone Dmitri at (888) 847-9860 prior to bidding.Mercedes-Benz of Westminster does not provide financing or leasing options for CA residents due to emissions standards and regulations by the state of California. Cash purchase only for CA residents. Buyers Inspection: Mercedes-Benz of Westminster has done our best to disclose all information known about this vehicle for auction. Mercedes-Benz of Westminster welcomes a buyers inspection. If you plan to have a buyers inspection, please make sure you inspect the vehicle prior to the auction ending. Inspection fees if any are Buyers responsibility. Representations and Warranties made by seller: This vehicle is being sold "as is". Manufacturer's warranties may still apply. Extended warranty may be available, e-mail or phone Dmitri at (888) 847-9860 for details. No representations or warranties are made by seller, nor are any representations or warranties relied upon by bidders in making bids. Taxes and Registration fees: Out of state buyers are responsible for all state, county, city taxes and fees, as well as title service fees in the state that the vehicle will be registered. All taxes and fees must be paid in full in order for vehicle to be titled and registered. Title Information: Vehicles titles may be held by banks or lenders as collateral for loans. In many cases there is a delay in receiving the original instruments up to 21 days from the time we pay a vehicle off. While we usually have all titles in our possession at closing, there are occasions where we may be waiting for them to arrive. If payment is made by cashier's or personal checks we will hold all titles for 10 days or until funds have cleared. Shipping & Delivery: All shipping charges are buyer's responsibility. Mercedes-Benz of Westminster will help with shipping arrangements but will not be responsible in any way for claims arising from shipping damage!Licensed Carriers are generally insured for $3,000,000.00. We assume no responsibility for damages incurred after the vehicle leaves our showroom. All shipping arrangements are provided by Mercedes-Benz of Westminster as a courtesy. We are not affiliated with any carrier. Any claims or other communication regarding shipment of vehicles will be between you and the shipper, not with Mercedes-Benz of Westminster. The amount of time it takes for delivery is dependent on the carrier, but is generally 7-14 days from the date the vehicle is picked up from our facility until it is delivered to your destination. Verify with the shipper for an Estimate Time of Arrival to be sure. Finalizing your Purchase: Mercedes-Benz of Westminster will contact the successful high bidder by e-mail after the auction closes. 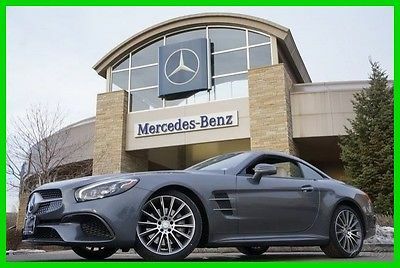 Successful high bidder MUST communicate with Dmitri at Mercedes-Benz of Westminster by e-mail or phone (888) 847-9860 within 24 hours of the auction ending to make arrangements to complete their transaction. If we cannot confirm your intention to buy or the sale is not completed within 5 days, we reserve the right to relist this vehicle or sell to any other qualified buyer. In order to secure bid on vehicle, Successful bidder (BUYER) must within 24 hours of bid closing send to Seller a Deposit in the amount of 10% by major credit card, cash in person or bank certified funds. Within 72 hours of bid closing, Buyer must send balance of funds by cash in person or bank certified funds to Seller. At time of sending initial deposit, Buyer MUST fax or email copy of their State issued valid Driver License. Furthermore, before said vehicle is released for shipment to Buyer, all other Sale related and title related paperwork must be signed and returned complete to Seller. Copyright © 2017 Auction123 - All rights reserved. - Disclaimer +- Auction123 (a service and listing/software company) and the Seller has done his/her best to disclose the equipment/condition of this vehicle/purchase. However, Auction123 disclaims any warranty as to the accuracy or to the working condition of the vehicle/equipment listed. The purchaser or prospective purchaser should verify with the Seller the accuracy of all the information listed within this ad. Selling a Vehicle? Create Professional Listings Fast and Easy. Click Here! Dmitri (888) 847-9860 10391 Westminster Blvd Westminster Colorado 80020 ? ? ? ? 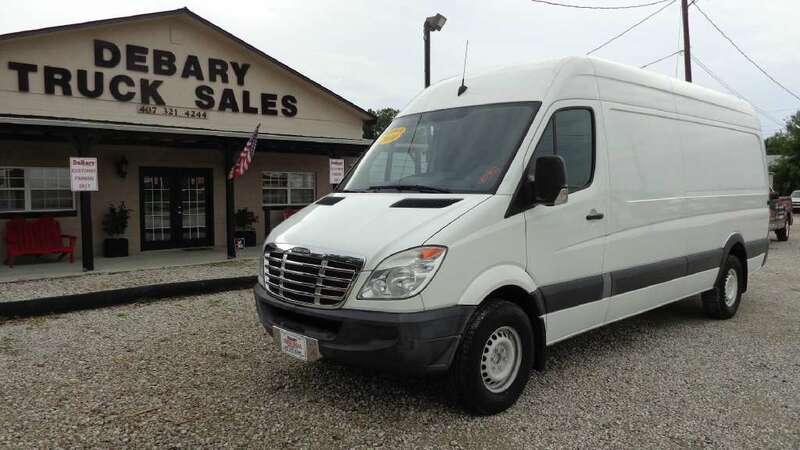 Vehicle Information VIN: 55SWF8HB4HU204387 Stock: HU204387 Mileage: 10 Color: Iridium Silver Metallic Trans: Automatic Engine: 4.0 L MPG: 18 City / 24 Highway Drivetrain: RWD ? ? ? ? 1 of 53 ? View Large Images ? ? Options Contact Mercedes-Benz of Westminster 10391 Westminster Blvd Westminster Colorado 80020 View Map Ask for:Dmitri Contact: ?Contact Us Toll Free:(888) 847-9860 Dmitri Direct:(303) 464-6639 Dmitri Text / Cell:(720) 254-8951 Terms Delivery and Handling Charges: To the negotiated price of each vehicle sold there will be added the sum of $599.00 for the cost and additional profit to the seller / Dealer for items such as inspecting, cleaning and adjusting new and used vehicles and preparing documents related to the sale. Placing a Bid: Your bid constitutes a legally binding contract to purchase this vehicle. Please do not bid if you're not seriously interested or financially able to purchase this vehicle. Please read eBay's User AgreementMercedes-Benz of Westminster reserves the right to, Obtain and verify the registered information of all users who bid on this auction. Cancel any and all bids at our discretion, or end the auction early if necessary.Bidders Age: You must be 18 years of age or older to Bid. Special eBay Bid Retraction Rules: Please read eBay's "Retracting a Bid" If you place a bid before the last 12-hour period of the auction: You may retract that bid before that last 12-hour period but only for exceptional circumstances. You will not be allowed to retract that bid during the last 12-hour period of the auction. If you place a bid during the last 12-hour period of the auction: You will be allowed to retract the bid for exceptional circumstances but only if you do so within one hour after placing the bid.Funds & Financing: For help in arranging for a Pre-Approved loan or for any questions please e-mail or phone Dmitri at (888) 847-9860 prior to bidding.Mercedes-Benz of Westminster does not provide financing or leasing options for CA residents due to emissions standards and regulations by the state of California. Cash purchase only for CA residents. Buyers Inspection: Mercedes-Benz of Westminster has done our best to disclose all information known about this vehicle for auction. Mercedes-Benz of Westminster welcomes a buyers inspection. If you plan to have a buyers inspection, please make sure you inspect the vehicle prior to the auction ending. Inspection fees if any are Buyers responsibility. Representations and Warranties made by seller: This vehicle is being sold "as is". Manufacturer's warranties may still apply. Extended warranty may be available, e-mail or phone Dmitri at (888) 847-9860 for details. No representations or warranties are made by seller, nor are any representations or warranties relied upon by bidders in making bids. Taxes and Registration fees: Out of state buyers are responsible for all state, county, city taxes and fees, as well as title service fees in the state that the vehicle will be registered. All taxes and fees must be paid in full in order for vehicle to be titled and registered. Title Information: Vehicles titles may be held by banks or lenders as collateral for loans. In many cases there is a delay in receiving the original instruments up to 21 days from the time we pay a vehicle off. While we usually have all titles in our possession at closing, there are occasions where we may be waiting for them to arrive. If payment is made by cashier's or personal checks we will hold all titles for 10 days or until funds have cleared. Shipping & Delivery: All shipping charges are buyer's responsibility. Mercedes-Benz of Westminster will help with shipping arrangements but will not be responsible in any way for claims arising from shipping damage!Licensed Carriers are generally insured for $3,000,000.00. We assume no responsibility for damages incurred after the vehicle leaves our showroom. All shipping arrangements are provided by Mercedes-Benz of Westminster as a courtesy. We are not affiliated with any carrier. Any claims or other communication regarding shipment of vehicles will be between you and the shipper, not with Mercedes-Benz of Westminster. The amount of time it takes for delivery is dependent on the carrier, but is generally 7-14 days from the date the vehicle is picked up from our facility until it is delivered to your destination. Verify with the shipper for an Estimate Time of Arrival to be sure. Finalizing your Purchase: Mercedes-Benz of Westminster will contact the successful high bidder by e-mail after the auction closes. Successful high bidder MUST communicate with Dmitri at Mercedes-Benz of Westminster by e-mail or phone (888) 847-9860 within 24 hours of the auction ending to make arrangements to complete their transaction. If we cannot confirm your intention to buy or the sale is not completed within 5 days, we reserve the right to relist this vehicle or sell to any other qualified buyer. In order to secure bid on vehicle, Successful bidder (BUYER) must within 24 hours of bid closing send to Seller a Deposit in the amount of 10% by major credit card, cash in person or bank certified funds. Within 72 hours of bid closing, Buyer must send balance of funds by cash in person or bank certified funds to Seller. At time of sending initial deposit, Buyer MUST fax or email copy of their State issued valid Driver License. Furthermore, before said vehicle is released for shipment to Buyer, all other Sale related and title related paperwork must be signed and returned complete to Seller. Copyright © 2017 Auction123 - All rights reserved. - Disclaimer +- Auction123 (a service and listing/software company) and the Seller has done his/her best to disclose the equipment/condition of this vehicle/purchase. However, Auction123 disclaims any warranty as to the accuracy or to the working condition of the vehicle/equipment listed. The purchaser or prospective purchaser should verify with the Seller the accuracy of all the information listed within this ad. Selling a Vehicle? Create Professional Listings Fast and Easy. Click Here!